A “wake” will then be held at Carlos’ house after the service (pot luck) so remember your funniest Darlene stories……and there’s plenty of them! Thank you all for a great day of remembrance and comradeship. Frank William Crawford passed peacefully on June 29th at Virginia Mason Hospital in Seattle at the young age of 89. After discharge, Frank moved to Seattle where he knew the William Burke family from Minnesota where they had neighboring farms and became lifelong friends. 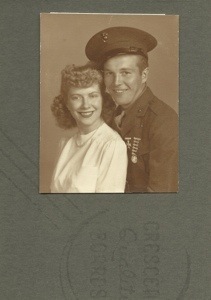 On July 17th, 1948 Frank married Peg Burke and they started their family. Frank’s first job in Seattle was at Seattle Iron Works. From there he became a Seattle Transit driver for 10 years and then became a delivery driver for Frederick & Nelson. In 1962 became a Driver-Salesman for Van’s P X and was soon promoted to Plant Manager. Frank loved working at the P X (usually working six days a week) and grew very fond of his co-workers. Frank was very generous with his time..mowing elderly neighbor’s lawns, helping people move and taking them shopping or to appointments. He was also the first to volunteer at his beloved West Seattle Eagles. Frank is survived by his daughters Colleen Powers (John), Kathleen Sackett (Doug) and sons Bill (Kathy), Jim (Freddie), grandchildren Dan, Gary and Kristin Powers, Keith Campbell, Emily Myers, Elizabeth Crawford, Nikolas Crawford, great-grandchildren Lauren, Daniel, Jordan and Dylan Powers, Alyssa Powers, Nolan and Rylee Vanbuskirk, Jonathan Myers, sister Marie Timpe and stepson Don Panton. Frank is preceeded in death by his parents and brothers Lawrence, Donald and Durand. The family would like to send a heartfelt Thank You to all of the Virginia Mason staff but especially the 9th floor staff for keeping Dad as comfortable as possible during his last month. We are extremely grateful to Colleen and John for opening their home to Dad the last 4 years. The family will have a final “Toast To Frank” on Sunday July 19th, 3:00 PM at the West Seattle Eagles, 4426 California Ave SW.
We are sorry to report that District 5 Past Commander Comrade Wes Steinruk (2006-2007) has passed away. Don graduated from West Seattle High School in 1965 and remained a lifelong resident of West Seattle. He was a University of Washington Graduate and served his country honorably in the Vietnam War. Don is survived by his wife Kris and daughter Alexa. He is also survived by three sisters, Audrey Anderson, Margaret Norberg, and Loretta Kirby, along with numerous nieces and nephews. Don fought a long and courageous battle against cancer; he recently led his Sundancers team at the West Seattle Relay for Life event. There will be a Celebration of Life Saturday, August 24, 2013 at 2:00 pm at the West Seattle Golf Course. Don was an avid golfer. I am sorry to report, that Comrade Howard Jessen from Post 10882, has passed away from cancer. His services will be this Friday, the 19th at 11 AM at the Cowlitz View Cemetery in Kelso. He has been a VFW member for many many years, and will be greatly missed.